The Kazan Kremlin is the chief historic citadel of Tatarstan, situated in the city of Kazan, which was built on behest of Ivan the Terrible on the ruins of the former castle of Kazan khans. The oldest building in the Kremlin is the Annunciation Cathedral (1554-62), the only 16th-century Russian church to have six piers and five apses. Like many old buildings of Kazan, it is constructed of local pale sandstone rather than of brick. The Kremlin's most conspicuous landmark is the mysterious leaning Söyembikä Tower, which probably goes back to the reign of Peter the Great. Reading other people's reviews of Kazan Kremlin I was wandering whether we visited the same place or everything changed so much in the last few years. I bet the latter as Russia indeed improved significantly and became more tourist friendly, making my third visit to that country the most enjoyable. Kazan Kremlin is located in the very center of the city, in a short walk from the train station. Its white walls are visible from a long distance and that view is really pleasant. On the top of some towers there are metal flags with UNESCO signs. The kremlin was built by tzar Ivan the Terrible after vanquishing of the whole Kazan Khanate and a complete destruction of Kazan. To commemorate the victory he ordered to build a magnificent Sobor Blagoveshchenski, which until recently was the biggest building in Kremlin. The sobor was a symbol of Christian Orthodox victory over Islam. Entry is free of charge, taking pictures forbidden. But history is sometimes very tricky. In 2005 a beautiful mosque Kul Sharif was built in the centre of the Kremlin. Now the mosque is reigning on the Kremlin, especially at night, and shows renaissance of Islam in this region. Although the building is controversial, I liked it and think it composes well with other buildings of the Kremlin. It is possible to visit and to take photos in the mosque. Other important buildings are Soyembika Tower and Tatarstan president palace. 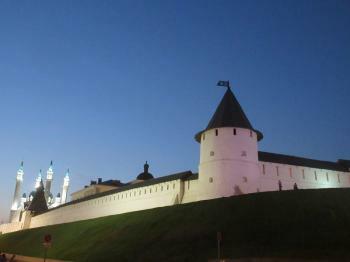 Entry to Kazan kremlin is free 24h and to praise its beauty I suggest going there during the day and at night. Overall Kazan is a stunning city, absolute pearl of the region and whole Russia, and can be compared with the best cities in Western Europe. In summertime the place is full of tourists, but almost all of them are Russians. Kazan was recently the host of some international sport competitions (including Universiade in 2013) and tries to be a cosmopolitan city easy to explore by foreigners. Although I am not sure whether it is so easy for those not speaking Russian, certainly it is easier than in most Russian cities, as at least all bus stops are announced in English. 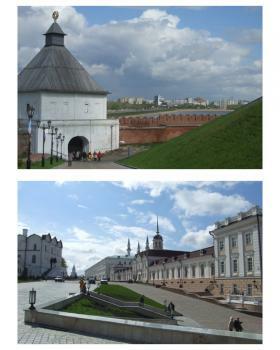 I went to the Kazan Kremlin on 1st September 2011. To be honest it was quite disappointing. The sun was shining and everything looked beautiful, but somehow the experience didn't live up to my expectations. For a city that boasts of its milennium status I for one could not embrace the concept that white walls were anywhere near 1000 years old, and it look like my suspicions are proved right by other posts. Whilst it was fascinating to step inside a mosque I found it an unsatisfactory experience. The glitzy finish of what is an oversized empty room didn't bring me any closer to God, but left me feeling like an intruder as we wore our blue plastic overshoes and were only permitted access to a viewing gallery. Imagine taking a trip to St.Pauls Cathedral in London and being told you were only welcome in a small part? Unlike my many trips inside cathedrals there was no evidence of faith through the acts of mere mortals within, but rather a thought that one was supposed to have a sense of awe, which I sadly didn't share. The mosque was a disappointment, but inside the Kremlin Orthodox Church I was actually assaulted by the security guard! There's no doubt the painting inside were impressive, but as a first time visitor I was quietly discussing what was going on at the rear of building. A qualified priest appeared to be traing a lay man on thart of "incantation". All of a sudden I was hit from behind on the shoulder by a guard who almost spat out a command to be silent (although visitors were speaking all around the interior). If something like this had happened in the street I would have been tempted to wheel round and strike my assailant in self defence. If this is the way the established church treats curious visitors it doesn't bode well for the established faiths of Kazan! After leaving the building the same guard was strutting about talking on his mobile and puffing a cigarette, which was hardly a good advert for his own walk with God. The best part of my tour (from local Kazan residents) was taking a look at the Soyembika Tower and hearing the associated legend. If it was indeed built in haste (7 days) then that would explain why it has shifted, and looks like falling over. As we walked away the local explained how the vast mosque weighed so much that it was actually causing land movement from the sheer weight and inadequate foundations. My guess is that it won't outlast this older famous monument. My final note on walking around the heart of Kazan, come preprared. There are precious few street cafe's and apart from the main shopping street no benches upon which to stop and rest your feet. Take some water with you, or better still go out to the surrounding countryside, which is breathtaking and absolutely teeming with all manner of wildlife. If you're feeling intrepid you might find caving on the banks of the Volga a more satisfactory experience. There no legislators to restrict access, and for those not suffering from claustrophobia and our small group spent nearly four hours climbing and exporing - simply brilliant! I may agree with the above stated. It may be a violation of a heritage structure and my first impression was negative. But when I saw that I had to change my opinion. There are some remnants of Tatar Khan graveyards close to Siusiumbike (so we can treat that as continuity of Tatar reign) but I would treat the mosque as underlining new tendencies of Tatar Republic. The mosque is built in the style of modern Central Asia mosques but as a whole it not violating the whole structure. In fact it is the most fascinating part of the whole Kremlin. It is very questionable how legitimate are the criteria of Kazan Kremlin inscription in the World heritage list. The true story is that in 1552 the Tatar fortress was completely destroyed by the Russians. No single monument or structure on the territory of Kazan Kremlin survived the invasion. The new fortress was built from scratch. That is why there is no way we can talk either of the "historical continuity and cultural diversity over a long period of time" or "the historic citadel represents an exceptional testimony of the Khanate period and is the only surviving Tatar fortress". Kazan Kremlin has been a piece of Russian Architecture until 2005 when a new Kul Sharif Mosque was finished. This fact itself is a violation of the World heritage site regulations. 5 years after the site was enlisted an entirely new object was built. It is claimed to be a "restoration" of the historic mosque that had been there before the Russian invasion, but no images or descriptions could be presented to prove the historcal or architectural links between the old and the new mosque. Kazan had long figured large in my city “do list” ever since, over 40 years ago, I first saw Eisenstein’s “Ivan the Terrible” with its magnificent representation of the city’s siege and the defeat of the Tatar Khans. Of course the Kremlin ensemble, built and rebuilt since the siege, can only faintly echo these events but, when we eventually visited in May 2007, we discovered plenty of interest (and controversy) there. Whilst, beyond, lies a handsome city whose style and substance should place it ahead of many other similar-sized European cities (population 1 million +) for a visitor’s attention. The Kremlin surrounding wall is capped in parts with wooden roofs and spires – several of which, perhaps incongruously and certainly un-authentically, sport the UNESCO WH logo (photo 1) – Kazan is clearly proud of its inscription! Inside is a melange of buildings, both religious and secular, from 16th to 21st (!) century – including 17th century towers, a 16th century cathedral and monastery buildings (other churches were destroyed in Stalin’s time and the monastery became a tobacco factory), a 19th century Governor’s house (still used as the presidential palace) and finally THAT mosque opened as recently as June 2005 (5 years after inscription)! All are joined by a long avenue faced by other classical buildings (photo 2). A fine plan of the complex with “mouse-overs” is on the Tatar President's Web site! The previous post raises a number of issues regarding the authenticity of the Kremlin and the words used by UNESCO to support its inscription. The site certainly provides an interesting example of the genuine problems in determining “authenticity”. Given the history of Kazan since its capture by Russia in 1552 it is hardly surprising that the Kremlin contains buildings of many periods. These reflect changes brought about by fire, revolution and indeed periods of prosperity and, to me, don’t seem to create a true problem. But is UNESCO trying too hard to be “inclusive” in identifying a “synthesis of Russian and Tatar influences” and in describing it as “the only surviving Tatar fortress with traces of the original town-planning conception”? These were not obvious and it all looked pretty Russian to me. One certain “Tatar influence” is the modern Qolsharif mosque. How did UNESCO so easily accept the building of the first mosque on the site since 1552? In its evaluation ICOMOS merely states - “The new mosque that is being built within the complex can be understood as new construction in a historic context, where it contributes to the traditional continuity and a balance between the different cultural elements of the place. It should be noted that, considering the character of the site, such a new building should be considered to be strictly exceptional.” Indeed it is perhaps unreasonable for WHS to be frozen as at the moment of inscription. After all, those 19th century buildings were new once and are now considered “authentic” so why not allow a (good) 21st century building if it reflects the continuity of use in this era? Of course one can fully understand the desire of the Tatars to assert their culture within the republic in which they comprise 52% the population. One of the reasons we wanted to visit Kazan was to see something of this republic in the heartland of Russia which had declared independence in 1990 (supported in a referendum in 1992). Perhaps wanting to avoid the fate of Chechnya, and sensing the reality of its bargaining position, it reached a compromise in 2000 by which it became a constituent republic of the Russian Federation but with special provisions for autonomy (negotiations still continue on the exact nature of these). As a result it seemed to us to be doing quite well on its oil wealth – support Putin, don’t rock the boat and you will be given a good deal of latitude to develop your country and culture as you wish. I guess many other European “nation states” are struggling with the same issue – including UK and Spain! The mosque represents an interesting manifestation of this compromise – but that doesn’t make it an acceptable intrusion into the architectural ensemble – I personally didn’t find it a harmonious addition. And it makes UNESCO’s stance against development at many other sites less logically tenable. Perhaps my distaste towards the mosque was enhanced by the inordinately long time spent there by the standard Kremlin tour! You can’t just take your shoes off as in mosques elsewhere but (except for the guide!) have to put on the “over-slippers” beloved of Russian museums to protect their floors. But this again demonstrates the uneasy status of the mosque – part museum/national monument, part mosque. As tourists (whether infidel or not!) we had to climb the special stairs and look down on the main chamber (empty of the “faithful” although we were told that it is used twice per day (Elsewhere I have seen twice per year?) for prayers) to be given all the construction facts – which seemed to boil down to Russian materials and Turkish labour and skills. Frankly, I was pleased to get out. Across the road lies the Annunciation Cathedral. Used for various “profane” purposes during the Soviet period its (extremely heavy) interior restoration has only recently been completed and, like the mosque, it too seems to double as, primarily, a museum and, less frequently, as a religious building. Interestingly, the restoration was ordered in 1995 at the same time as the decree to build the Mosque. Another example of Tatarstan trying to be totally even-handed as between religions! It was even granted a “big event” to mirror the opening of the mosque 1 month earlier with the receipt on July 21 2005 of a historic copy of the Icon of our Lady of Kazan given to the Russian Orthodox Church by Pope John Paul II. But that is yet another story! In short, a visit to the Kazan Kremlin should provide you with myriad strands of interest to follow up and many useful reference points for understanding Russian history and society from medieval times to the present! Mausolea: The remains of 15th and 16th centuries mausoloea were recovered at Syuyumbeki Tower. Golden Horde: "Built on an ancient site, the Kazan Kremlin dates from the Muslim period of the Golden Horde and the Kazan Khanate." Multiple Religions: Crit iv - "showing the impact of Islam and Christianity." 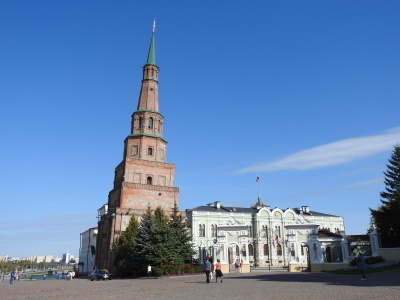 Built in the 16th century: "The Kazan Kremlin is a medieval fortress; its inner space ....contains buildings dating from the 16th to the 19th centuries, with remains of the 10th-16th century fortifications and structures." (AB). The Kremlin "on view" was constructed after the taking of Kazan by Ivan the Terrible's army in 1552 - in particular, the fortifications and the Cathedral complex are 16C.